12/20/2018 – All oca varieties that will be available for 2018/19 are now in stock. 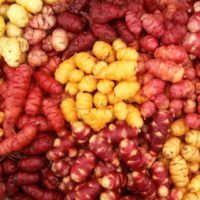 Four important tuber crops were developed in the Andes: potato, ulluco, mashua, and oca (Oxalis tuberosa). Oca is arguably the next most adaptable to temperate climates after the potato. Tubers are small, mostly 2-4 inches in length, but amazingly colorful. Cooked, they are somewhat similar to potato, but softer and often with a more acidic flavor. Yields are best in climates that remain frost free until mid-November.